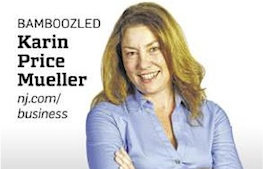 Bamboozled: Her new pup took ill; who should pay bills? When Elizabeth Liebold’s 11-year-old Wheaten terrier, Callie, died of pancreatitis, Liebold said she was inconsolable. The $5,000 in veterinarian bills didn’t matter, she said. She just missed her companion. Liebold, a widow, said she knew she wanted a new dog. She joined an animal shelter, but decided she wanted a puppy. Another Wheaten terrier. Liebold spied a pet shop down the road from the shelter: Just Pups of East Hanover. She took a look and fell in love. That was Sept. 2. Liebold paid $1,100 plus tax for the almost 12-week-old Wheaton terrier, records show. Liebold also received a one-year health guarantee, and she took Rosie home. Two days later, Liebold brought Rosie for a free exam at a Just Pups-approved veterinarian. Rosie received a clean bill of health. 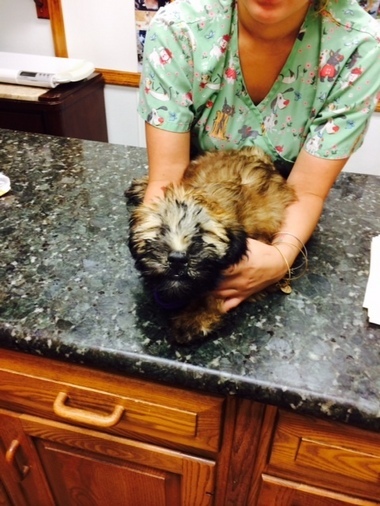 But on Sept. 9, one week after Liebold took possession of Rosie, the puppy wasn’t right. “I was holding her and she was making gagging noises,” Liebold said. So that day, Liebold took Rosie to her own vet — the vet who treated her other dog, Callie — and Rosie was diagnosed with a respiratory infection. The vet prescribed antibiotics and sent them home. Rosie usually spit out the meds, Leibold said, but she thinks she got down one pill, maybe two. “The next day, she was so sick,” Liebold said, and she returned to her vet. Rosie was hospitalized with pneumonia on Sept. 10. The next day, Liebold said, she went back to Just Pups in tears. On Sept. 13, Rosie was still in the hospital, but improving. Liebold returned to Just Pups, and a manager again said to send the bill to the shop, Liebold said. Rosie came home the next day, and Liebold had a bill for $2,266. Just Pups is owned by Vincent LoSacco, according to public records. It has New Jersey locations: East Hanover, Paramus, East Brunswick and Emerson. It also has a location in Valhalla, N.Y. There have been nine lawsuits against the company in recent years, public records show. One resulted in a judgment. Four others were settled, two were dismissed, one defaulted and one is still open. Rosie, whose hospital stay led to a large bill that her owner, Elizabeth Liebold, says the pet store should pay. There were 13 complaints total against the other three stores in 2013 and 2014. The one-year health guarantee Just Pups gave to Liebold promises free treatment for animals in the first year, as long as it’s with one of the store’s recommended veterinarians. “If a congenital health issue or illness arises during the first year of purchase, and the purchaser chooses to take their puppy to a veterinarian who Just Pups has not referred or recommended, this health guarantee becomes null and void and the purchaser assumes total financial responsibility for 100 percent of all veterinarian bills,” it reads. It also cited the purchaser’s rights under N.J.A.C. 13:45A-12.3 and with the Pet Protection Act. While the law offers many protections for consumers, it doesn’t say anything about a need for treating veterinarians to be recommended by the seller. That means the health guarantee given by Just Pups changes the responsibility of the consumer. Is that allowed by law? Anthony Vignier, a Kearny-based attorney, said under normal circumstances, the contract is going to take precedence over the statute unless the contract is completely contrary to public policy. “I don’t see that being the case here,” Vignier said. Liebold said she never considered the Just Pups-approved vet. Liebold understands what the health guarantee said, but in the heat of the moment, she said the fine print wasn’t on her mind. Vincent LoSacco, who said he’d look into the case. Two days later, LoSacco shared with us a letter he was sending to Liebold, and it provided a new twist. The letter said Liebold’s vet, and not Just Pups, should be responsible. “They prescribed your dog Rosie an antibiotic that has not been created nor recommended by its manufacturer to treat or cure the illness that they diagnosed her with (kennel cough). That was unlawful,” the letter said. “Most veterinarians are well aware that Clavamox is not made or recommended by its manufacturer to treat or cure kennel cough, and that prescribing it for such usually ends up with the kennel cough progressing into pneumonia, resulting in an exorbitant veterinary bill that profits the animal hospital and/or veterinarian(s),” LoSacco wrote. We together examined the medication’s spec sheet from the manufacturer, which does not mention respiratory illnesses. LoSacco readily admitted he’s not a veterinarian, but said he’s learned a lot from the vets he works with. He said Clavamox is ineffective against pneumonia. “Veterinarians don’t want to just treat the kennel cough, they want the patient to come back with pneumonia, which means a bigger vet bill of $3,000, $4,000, $5,000 for pneumonia,” he said. LoSacco said his health guarantee requires customers to use his vets because he trusts those vets to properly treat animals. LoSacco said that, to his knowledge, no other dogs in the store came down with illnesses when Rosie was in the store, and he said they’d never sell an animal who wasn’t healthy. Liebold’s vet, Dr. Silas Ashmore of All Creatures Great & Small in Fairfield, defended the use of Clavamox. He called Clavamox the No. 1 drug for such infections. “You can call 50 vets and ask if they use Clavamox and they will say that whether it’s on the label or not, that’s what treats it,” Ashmore said. We looked for voices without skin in the game. “Clavamox is commonly used to treat any respiratory infection,” said Dr. Mark Freeman, an assistant professor with the department of Small Animal Clinical Sciences at Virginia Tech. He said Clavamox is relatively safe for young dogs, while other, stronger antibiotics can be questionable for young puppies. Freeman said he disagreed with the store owner’s assertion that the drug is used “off-label” when used for respiratory illnesses. Christopher Byers of the American College of Veterinary Internal Medicine (ACVIM) said Clavamox is common for a variety of conditions including respiratory diseases. 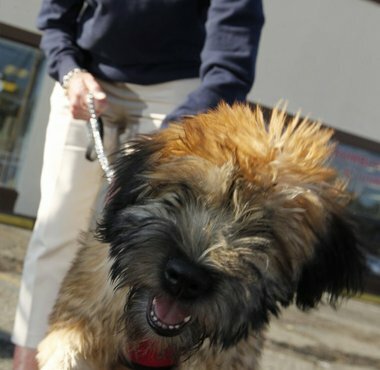 Rosie, the Wheaten terrier, is now healthy after a bout with pneumonia that led to costly vet bills. “It is a reasonable first-choice antibiotic for a patient suspected of living with bacterial Canine Infectious Respiratory Disease Complex (CIRDC),” he said. We also reached out to the drug’s manufacturer, but it wouldn’t comment except to share the written indications we already had. We went back to owner LoSacco with the vets’ comments, noting that the treating veterinarian said he never called the illness kennel cough, but a respiratory infection. “It changes nothing because Clavamox is not indicated for upper respiratory,” LoSacco said, offering to resend the letter with the words “respiratory” instead of “kennel cough.” He also said medical dictionaries don’t consider respiratory issues and soft tissue to be the same. So where does this leave Liebold, the customer? Probably with a vet bill, but she says she’s glad Rosie survived. “I don’t want anyone to go through this experience. Educate yourself before buying a pet in a pet store,” she said.